An all-day smooth and creamy vape that is rich but not too heavy. Whisk away to a tropical oasis with this exotic fruity blend. Life really is a beach. For me, this flavor was about 60 percent pineapple and 40 percent coconut/other fruits. I tend to go with JamaicanMeVape because I find it more like 90 percent pineapple, which I tend to like. 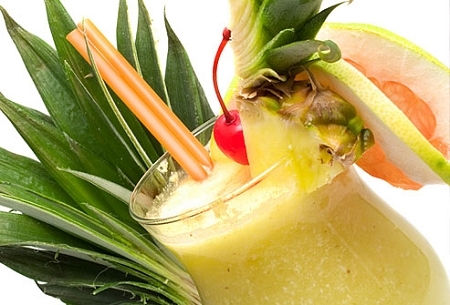 But Pina Colada is a great flavor that really stays true to the name. It's smooth, fruity and cool. Love it! Good coconut flavor. What I think makes it shine is the strong pineapple flavor. It's like I just took a bite of a fresh pineapple and it has that tart and sweetness to it. Some things that advertise as pina colada are heavy on the coconut. I feel this is heavy on the pineapple, and I like that. Let me first start out by saying I never vape one flavor for very long because I get tired of the same flavor very easily. Pina Colada is one flavor that I can smoke time after time, day after day, and still not get sick of it! Love the taste and the vape production is awesome! Definitely top 5 of my favorite liquids! Copper mechanical mod with and IGO M RDA. I got piña colada as a 7ml sample and I have to say that it's much better than Jamaican VapeMe. A great balance between pineapple and coconut with a creamy undertone that blends the flavors into one fruituristic fusion! But when I added 3 drops of menthol flavoring, I created a Cosmic Fusion which enhanced the embodied flavors in this juice to new heights.... Oh Man... I can't get enough of it!! I'm going to order a 17ml with an order of coolio next time. Everyone should try an order of this or request a sample of it- enhance it with either menthol or coolio for a refreshing out of this world experience!! One more awesome flavor by AltCig!! This vape is soooo smooth and fresh I wish I would of gotten a bigger bottle. Nothing better than open, drip and vape, and all without having to steep it. P-E-R-F-E-C-T.